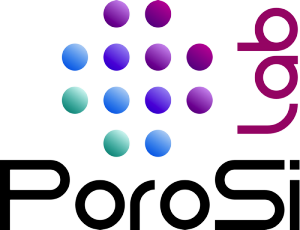 The Porous Materials Research Laboratory focuses its activities on research topics related to the use of Porous Si (PSi). PSi is an extremely versatile material, biocompatible and with a large inner surface that can reach 900m2/cm3, that is about the surface of five volleyball fields contained in one cubic centimeter. PSi applications range from biosensors to drug delivery systems, from optoelectronics to photovoltaics. The fabrication of all-silicon devices for the emission of light would enable a significant savings in the costs and production times of the devices, as well as an improved efficiency. The problem of the indirect Si bandgap makes it substantially impossible to manufacture these devices without doping. Among these dopants, rare earths such as erbium and ytterbium have emission lines in the transmission bands of the optical fibers, that is to say in wavelengths of interest for the telecommunications. However, so far it has not been possible to realize devices with a sufficient optical gain for the required applications. In the case of PSi, the main point of rare earth doping was considered primarily a choice of the mode of oxidation and the amount of Er inserted, but little has been done to really understand and control the processes Er-doping in itself. This is particularly true for the porous Si matrix. Since it is precisely at this stage that Er gets in contact with the large internal surface of the Si porous, it is clear that a better understanding of the doping process is an essential step towards its optimization. In our research group we are therefore engaged in the characterization of PSi layers doped with Er in which the doping process is characterized by means of electrochemical techniques (from the electrochemical process of insertion Er to the Electrochemical Impedance Spectroscopy), optical properties (mainly reflectivity and luminescence ), microscopy (mainly SEM and SEM-EDS) We also study the thermal treatments following the doping. In the exploitation of renewable energy sources, the collection of energy directly from the Sun is one of the most interesting since the amount of energy impinging on Earth from our star much larger that the effective actual needs. Most photovoltaic devices are currently based on silicon and innovative solutions for improved devices for the collection of the solar radiation imply the research in the field of new materials, among which it is certainly worthwhile to emphasize the role of organic materials. Moreover, a significant interest is raising for organic-inorganic hybrid materials, where the advantages of the two component materials are joined in a new one. With PSi, the purpose of our research is to provide devices based on PSi impregnated with conducting polymer having a good absorption coefficient in the visible spectral region, so that they can improve the light absorption of the pristine PSi and then its ability to collect the sunlight. For the fabrication of our hybrids we use melanin and PANI. Melanin is a polymer that we all know for the color of our skin in summer, which has an interesting curve of light absorption in the visible region and the near infrared. PANI is a conductive polymer that has also interesting properties and whose electrochemical fabrication process can be adapted for tailored modification. Our results show that this type of organic-inorganic hybrid has an interesting potential and we are now optimizing the structures and the comparing different polymers.